Which is pretty much the most awesome "Secret Santa" group ever. Warnings: Avoid if you're afraid of very large fish. Creator’s Notes: Again, I really really really loved this request. This is #2 in, what I hope is, a much larger series. So, to get the Quake Medallion you had to go upstream of the Lake f Ill Omen, where the Waterfall of Wishing sort of is in the Light World. In the deep water, under some cliffs, you'll see a ring of stone. When you toss something into it (like the sign that mentions tossing something into it) the Catfish will appear and give you this~ Which you will need to get into Turtle Rock. Funny enough, Turtle Rock is pretty much directly above this guy. So I like to think it fell down those sheer cliffs into his pool. Art-wise: I didn't really know what to do with the clouds and sky (they seem kind of half-assed to me) but I remembered, when you were up on Death Mountain looking down- they kind of clung halfway down and it looked like there was a lot of lighting below them. And, when you're on the Pyramid of Power, the sky appears to be pink and gold. So, anyway, that's kind of what I tried to go with. I just couldn't think of a decent way to arrange them. I always liked how dark the water always seems in the Dark World. And, again- pink in the hair- woot! I used some stock of pool water, "grunge," and a rock wall from CgTextures. Looked at some pics of catfish because... its a little hard to remember what they really look like. Wow... 20 years later (probably more!) and I still remember this scene from the game so well! You did an EXCELLENT job capturing it! Nice representation of the Dark World. Don't envy Link standing in that water though, water created by the Demon King's wish is probably very nasty stuff. What do you mean by secret santa? Honestly, had I been Link in this picture, (it's absolutely gorgous, by the way ) I would've taken one look at what was ahead and said "Oh hell na." The end. Role the credits. Beautiful, love the atmosphere and colors. Great artwork! I feel like you captured the atmosphere of the Dark World very nicely. As well as the conversation between Link and the catfish. Well done! I love seeing artistic interpretations of the Dark World, especially of its sky since we get very little sense of what it looks like. Great concept for that moment in game. Thanks for sharing! ....and yet I still feel the need to fave this. This is just beautiful. Wow, I really need to play this game again. I barely even remember this!!! "Have a medallion. Now GTFO"
Yes! this is the kind of thing I imagine as I play the game. Awesome! Woah! That's epic. I love the color choice in this one. What a great atmosphere! I love how the water glows. Lttp is my favorite Zelda of all time. This picture is amazing!!! I'm in awe of how beautiful this is. I've always loved your art, but being out of the art world for quite some time and returning to this...I have to say I am extremely impressed by the improvement you have undergone. Absolutely fantastic. Wow. Such a great piece! There's a surprising lack of Dark World Zelda art, and yours are the best. I hope you do more, observe some of the regions perhaps like Village of Outcasts, the Skeleton Forest, and so on. god this is incredible, this is possibly the most underrated Zelda fanart I've seen. Really nice job! There isn't enough LTTP, really. This is about how the D&D Shadowfell can really look. i remember that part of the game! Dude let it me know if you do or have more art of A Link to the Past! 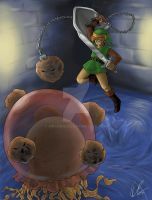 This is so cool and I love Link! Kyah! I do so love your Zelda works... Sooo purdy. This is really cool. I like it when people make pictures of less-memorable scenes from a game. It makes the entire game feel great, not just the big climaxes. You did this really well. hahahahah im a mad zelda fan and i have a bestie with a birthday and i searched "catfish" and i found this lol great job! I think the colors here are just fantastic. So eerie and yet also beautiful.